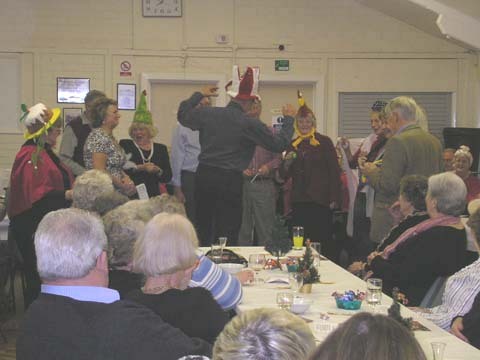 The Senior Citizens Christmas Party took place on Saturday 2nd December in the village hall. A meal of ham and turkey with salad was served followed by a delicious trifle and tea and coffee. 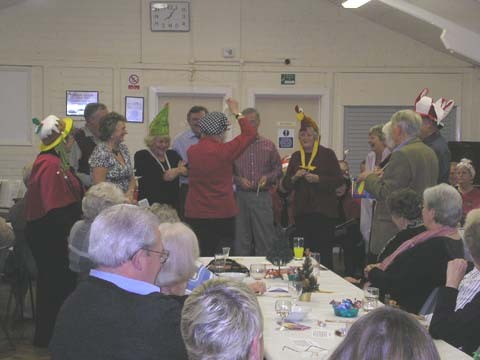 The tables were laid with Christmas crackers, assorted cakes, sweet and crisps. Everyone was offered a glass of beer or wine and of course a piece of Christmas cake. 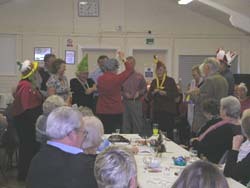 The ever popular Bingo, organised by Don Brown, was played after the meal. 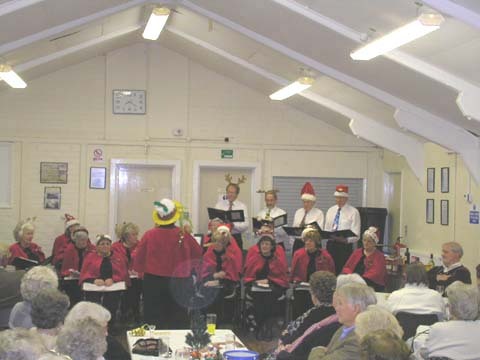 The main entertainment of the evening were the excellent Trentside Singers. The members are ladies of W.I. made up from the villages of Theddlethorpe, Willingham, Upton and Kexby. They were accompanied by four gentleman calling themselves the Four Fivers (not the Three Tenors! ), who occasionally help them out. 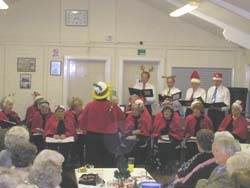 They entertained with various Christmas songs and carols, some of which everyone could join in with. This was followed by a hilarious version of the Twelve Days of Christmas with twelve “willing volunteers” from the audience who were provided with suitable props. A little later all were invited to sing a rendition of Rudolph the Red Nosed Reindeer – in Latin (words provided) – with varying degrees of success. The evening was enormous fun and greatly enjoyed by everyone. All senior citizens resident in the parish were invited, with 93 attending and 26 meals being taken out to those unable to travel. District Councillor Ken Bullivant was “Master of Ceremonies” expressing grateful thanks and appreciation on behalf of everyone to Claire and her merry band of helpers for all their hard work organising such a successful and entertaining evening.